Fall’s wicked transformation into winter is the harshest of all seasonal shifts. One night of deep-space temps and the open water you were casting the evening before can turn into a skating rink. But even though the terrestrial atmosphere has taken on a totally different look and feel, not much has changed below. Walleyes, pike and perch, to name a few, are still sabotaging shiners and young-of-the-year fishes in and around the last green weeds left in the lake. The Fin-Wing’s baitfish shape and realistic swim are eye-candy to winter walleyes. 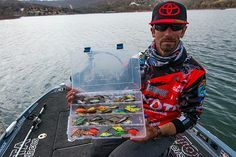 This makes figuring out where to fish quite elementary – simply bore a hole over the very last place you fished in the fall. And while tactics may have changed from horizontal to vertical presentations, there’s one lure that that makes a seamless transition from soft-to-hard water – Keweenaw Tackle Company’s Fin-Wing. Right before ice up, casting a Fin-Wing and employing a slow, steady retrieve is a deadly cold-water approach. 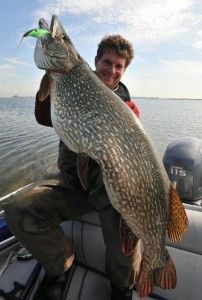 Even at sluggish speeds, the lure sways its tantalizing swim up and over the vegetation without diving in and snagging. And the “wings” of the lure flash brilliantly, even in low-light conditions, and get noticed from afar. In addition to the super-sharp, high-quality treble hook attached to every Fin-Wing is a wide-gap single J-hook that makes the bait even more weed resistant. It’s perfect for tipping with a lively minnow or portly soft plastic to bulk up its profile and add fish-tantalizing flare. Once the water’s exterior has frozen over, however, it’s time to rotate the presentation and vertically fish it. The jigging motion is pretty straightforward, too, as the Fin-Wing does all the heavy work. Lift the rod tip, drop it quickly and let the lure free fall on slack line. The Fin-Wing will dart up, then literally turn and “swim” nose down until your line’s taut. The exclusive action is based on the Fin-Wing’s unique shape. 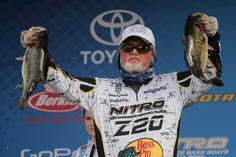 Even heavy-duty fluorocarbon leaders of 20-pound test won’t impede the lure’s action. 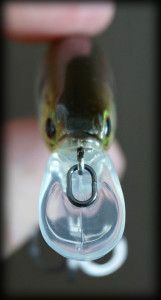 If you’re a meat lover, consider swapping out the treble hook for the included single hook. 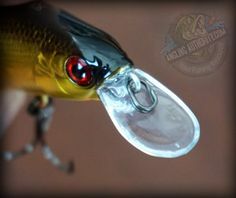 Nip on a full live minnow or just the head – dealer’s choice. Impressively, the added organic mass has little effect on the Fin-Wing’s action, the lure still wobbling wide and diving head first. Like back when the Fin-Wing was developed in 1948, it is still stamped in the USA using high-grade metal. Today’s Fin-Wing is painstakingly finished in a dozen classic colors… 10 with translucent hues. All are tinted with UV paint to accentuate the palette of patterns. The dynamic Fin-Wing is available in 1/4-, 3/4- and 1-ounce sizes to match the scale of nearly any forage with fins. There’s no need to fret when your favorite waterway suddenly freezes over. Just take that Fin-Wing you’ve been using to fool fish in open water and vertically jig it. 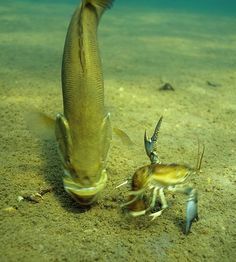 The fish will attack it with just as much vengeance.